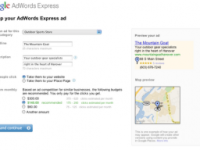 Is Google’s AdWords Express Right for Your Hotel? Online advertising is growing at fast pace and is actually projected to surpass print in spending for the first time in 2012. AdWords specifically has been successfully helping companies generate more business for many years but many are unaware of Google’s AdWords Express. Google AdWords Express is online advertising that aims to make advertising as easy as possible for local businesses by doing most of the work for them. Google automatically manages many of the components that you will find in traditional AdWords such as keywords, bid setting and managing those bids. It’s ideal for businesses that would like to get involved with paid advertising but may not have the time or resources to analyze and manage advertising campaigns. So what exactly does AdWords Express do for you to make the process simpler for the advertiser? Well there is quite a few including managing your keywords, bids and targeting your ads. There is no need to deal with analyzing keywords or figure out the best areas or demographics. Since Google is doing most of the work you can have some relief that they will attempt to optimize your ads based off their ever changing algorithms. What you will have to do is give some basic information about your company, determine your budget and Google will take care of the rest. You don’t even need a website to participate; Google can direct potential customers to a Google Places page or Google+ page. This may sound great and it could be for the right individuals but there are some concerns you should be aware to determine if AdWords Express is right for you. Paid advertising is not rocket science but there is a fair amount optimizing to do and it can be somewhat complex which can really be a big difference for your business’s bottom line. Optimizing your online advertising requires that you test different ads and see which ones are performing well and which ones are not. You want to know which ad’s have lower click through rates (ctr) and conversions so you can decide whether you should improve the ads or scrap it all together. There are negative keywords that may need to be included to eliminate people who may not want what you’re selling. You want to know which exact keywords, or phrases are generating the most clicks and determine if a bid should be raised or lowered. AdWords can be a very efficient and effective way to generate business online but it can be quite consuming and so if you don’t have the time or resources to dedicate to paid advertising then AdWords Express may be just what you are looking for. AdWords Express takes the guess work and know how out of paid advertising and that is not always a good thing. If you don’t have the time then AdWords Express is probably better than nothing and a good start but taking control of your ad campaigns is what you should eventually aim for.